Ditchling is a pretty village with over 1,000 inhabitants there is plenty to besides rambling or cycling. Try Ditchling Common for wildlife or try eating out there are a small range of restaurants from English to Fusion and some more traditional fare can be found in the pubs. Up until 1989 there was a Guild made up of craftsmen and artists with their own shops this artistic presence is still evident today. Hog roast cooking is similar to medieval cooking on which a pig was put on a spit roast and cooked. The spit roast has been updated for the 21st Century, allowing true portability with our hog roast machines. We can do more than just pork, we can cook a range of meats from beef to poultry and also cater for vegetarians. Our menus can be a hog on a roll to a four course sit down buffet including a meat of your choice, a range of salads or vegetables, potatoes i.e. new potatoes with butter, a dessert such as lemon cheesecake with pre drinks if required. We can also offer fish dishes and homemade burgers if requested. When you send us a query, we aim to reply back within 24 hours. We want to get it just right so we will respond to your query by our website or phone we will send a quote and a range of menus within your price range. We also offer an individual menu to suit you and we can talk the final details with over a coffee. We listen to what you want that’s why one of nicknames is the listening ear in. If you would rather do the cooking yourself, we also provide machine hire, the advantage of hiring a hog roasting machine is you’re in control of everything and you get to show off your culinary skills to your guests. We deliver, demonstrated how to use the machine and then collect it when you’re finished with it. All the hog roast machines are CE marked, regularly checked so they follow health and safety standards. We can also supply the meat, be it whole pig or lamb. 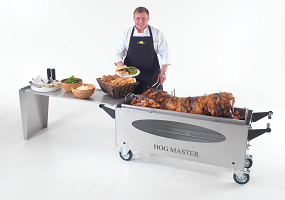 The hog roasting machine itself is versatile and there are different sizes for smaller or larger events. The machine can cook a number of ways and has space for two pans. Hog roasting keeps the meat succulent and it is also eye catching for the guests. No matter where you host your party, at your home in your garden, or at the back of the local pub or just about anywhere else in fact. We can ensure you’re ready and well equipped to manage on your own.